The Hanse 315 is an example of a large firm concentrating the best of its products into a more compact, feature-rich yet user-friendly version. We found in our test – see the full report in Yachting World February 2016 issue – that she is perhaps the best compact production yacht launched in recent years. 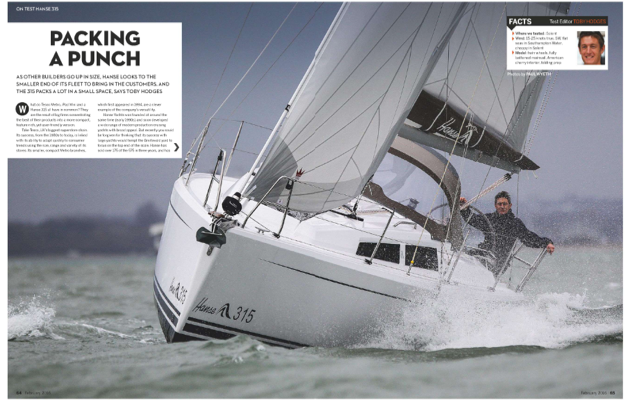 The benefits of the Hanse 315 all start from a modern, powerful Judel Vrolijk-designed hull shape. This has a long waterline with broad aft beam creating the option of twin wheels – the smallest production yacht to offer this – and a generous aft cabin. The only downside is that her price tag isn’t quite entry-level. The attractive-looking base price of £54k ex VAT, rose to £99k inc VAT for the test boat. That aside, this is a highly impressive new launch – the Hanse 315 has the space and pace of a 35-footer with the price and practicality of a 30-footer. The Hanse 315 = manageable, easy and really enjoyable.